As more and more companies utilize online resources, there has been a growing trend in telecommuting. In addition, many small business owners launch endeavors from their own homes. In fact, approximately 50% of small companies are home-based business operations, according to the latest statistics from the United States Small Business Administration Office of Advocacy. 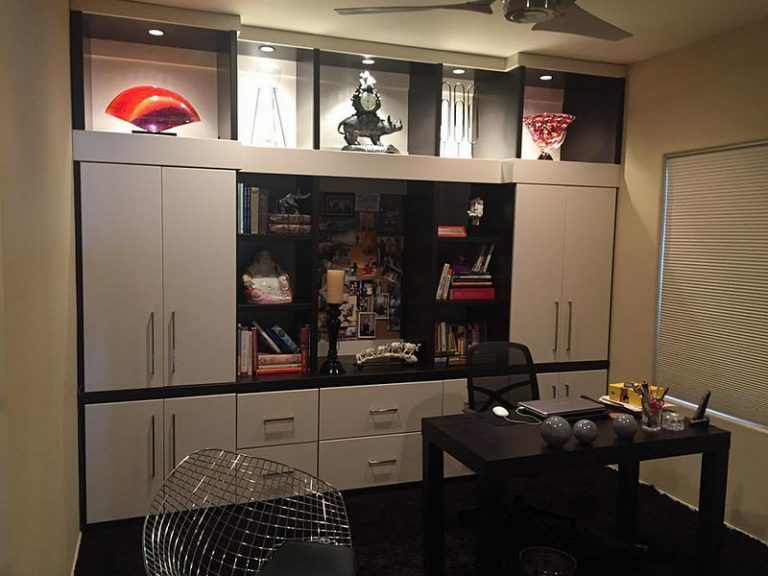 Whether you are launching a new business from home or have recognized that your current home office is inadequate to support the work you do every day, you should know that a well-organized space can help you accomplish tasks faster. Many older homes weren’t designed for the modern home office, so it should be no surprise that the storage space you need may be in short supply. This is why you will want to maximize the effective use of your space with a carefully chosen home office storage system. Start off with a desk and chair for you. If you plan on meeting with clients, you’ll want additional chairs or a couch to accommodate visitors. Eventually, another desk or workstation may be needed for another employee or assistant. Smartly designed layouts will solve these issues. When it comes to electronics, like a computer, phone, and printer, everything can be stored neatly with built-ins. Make sure you also have room for reference books and paperwork. Lockable file drawers can be crafted into your home storage unit. If your business involves selling physical goods, shelves and cabinets can keep samples on hand. If you’re looking to maximize your space or if standard solutions won’t fit in your workspace, custom is the way to go. Custom furniture that can be manufactured to meet your unique needs to transform your office into a professional and functional room that you love to work in. A neat office shows that you take pride in your work environment, and can help show potential customers that you have your act together. This is a great first impression as you grow your business. You’ll need to find experts who can help you with a customized solution. This can include a desk that is built to your exact specifications and cabinets that fit along the walls. When you’re ready to set up a home office or upgrade your existing home office with a storage system to improve organization and get the most out of your workspace, it’s a good idea to work with home organization professionals such as the team at Closet & Storage Concepts.